I wanted to create something to go with all three coffees. 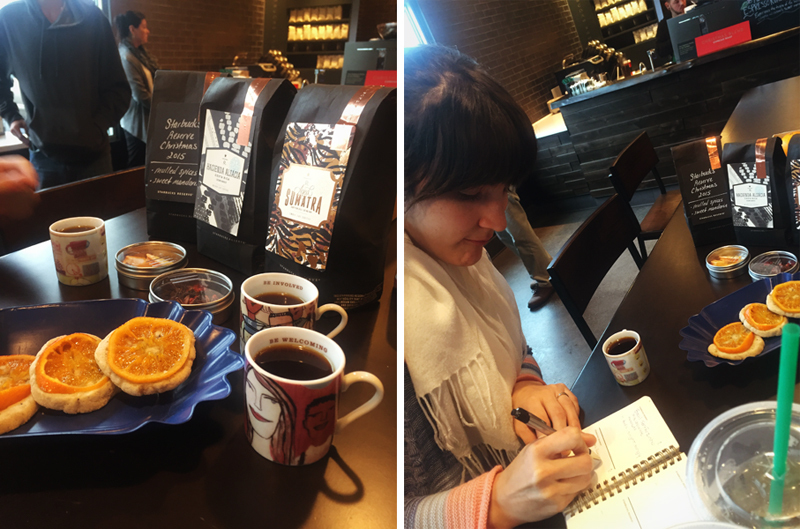 The candied mandarin orange with the Hacienda Alsacia, the mulled spice cookie with the Aged Sumatra, and together with the Reserve Christmas blend. To be able to do a deconstructed coffee and food pairing is so much fun, and is a great way to learn how to taste and describe coffee. The aged Sumatra goes so well with the spiced cookie, the cloves really compliment this coffee well. The Hacienda Alsacia is the complete opposite. It is bright, floral and sparkling. The super sweet candied mandarin really brings out the sweet citrus and juiciness of this coffee. Put the two coffees together, and you have something magical. The reserve Christmas blend is extremely aromatic. It reminds me of pink peppercorns, spicy but still very sweet. As the coffee cools, the sweetness dissipates, and the cedar qualities are revealed. There are many different layers to discover in this Reserve coffee, and I can’t wait to experiment more with it! 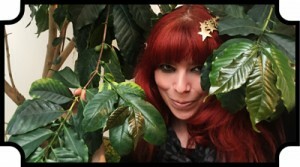 Geeking out over coffee is so much more fun with a friend, so I invited my friend Tiffany out to drink coffee and chat! Using a spice grinder, grind the peppercorns, cloves, allspice, cardamom and star anise until you achieve a fine powder. If you do not have a spice grinder, you can use pre-ground spices. In the bowl of a stand mixer fitted with the paddle attachment, beat butter until smooth. Add the sugar, and continue to beat until smooth. Add the egg and vanilla extract, and mix until incorporated, scraping down the sides as needed. Add the flour, sea salt, and mulled spices, mixing just until combined. Give the dough one last mix with a spatula to smooth out any lumps and make sure no streaks of flour are still visible. Turn the dough out onto a piece of parchment, and roll into a log about 1½-inch thick. Wrap the parchment around the dough, and chill for at least 1 hour in the fridge. You can make the candied mandarins while you wait (recipe below). Preheat an oven to 325°F, and place a rack in the middle of the oven. Line a baking sheet with parchment, and set aside. Take the cookie dough from the fridge, unwrap, and slice into ¼-inch rounds. 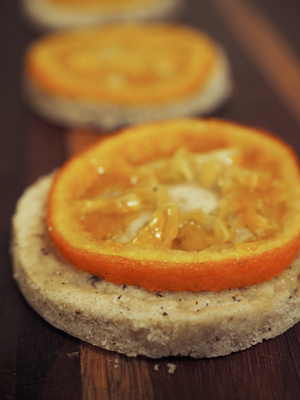 Place rounds 2-inches apart on the prepared baking sheet, then top each round with a slice of candied mandarin. The cookies will spread a bit as they bake, so don't worry if the slice completely covers the cookie. Bake for 18 - 20 minutes until the edges of the cookies start turning a light golden brown. Let the cookies cool for 10 minutes on the baking sheet before transferring to a cooling wrack. .
Wash the mandarin oranges throughly. Slice mandarins into ¼" rounds (I eyeballed it). In a saucepan, combine water and sugar. Heat on high until sugar is dissolved and mixture is boiling. Add mandarin slices and reduce heat to medium-low. Make sure the mandarins are completely submerged, then cover and let simmer for 10 minutes. Remove from heat and let slices cool for 10 minutes. Using a slotted spoon, transfer the slices to a cooling rack. Let cool and then they are ready to use on the cookies, or to eat on their own! I can always send you some if your area isn’t getting any 🙂 just let me know!